You should be growing these springtime herbs in your own garden whether it’s a window box, patio planter, or backyard garden, each is easy to grow. You’ll love having fresh herbs on hand and I doubt you’ll want to return to prepackaged once you try them. Mint – How can you possibly go wrong with fresh mint. Spearmint, peppermint, and even chocolate mint are great for treating stomach upset and just taste terrific on so many things. (Avoid using peppermint and some others with infants and small children.) Try a bit of freshly picked mint to top off your smoothie, frozen yogurt, or fruit salad. This does spread so be certain to contain mint so it doesn’t take over. Basil – Known for being refreshing, this intoxication scent will leave you wanting more basil. It contains anti-depressant and anti-inflammatory properties. Try Holy Basil for it’s claim to lower blood pressure and blood sugar levels. Lemon Balm – What herb garden it’s complete without Lemon Balm. Just search our blog for great recipes including Lemon Balm Butter and you’ll soon be hooked on the great taste of this mint family plant. It’s also an anti-depressant and it’s antiviral properties make it great for treating certain skin conditions. 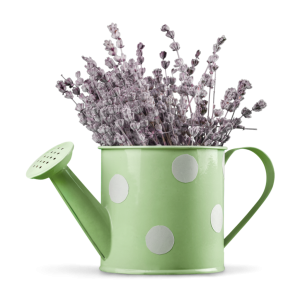 Lavender – Popular for it’s very pleasing scent, Lavender is also great for keeping away flies and other annoying insects. It’s also antiseptic and it’s scent it pleasantly calming. Chamomile – Part of the sunflower family, who hasn’t enjoyed a Chamomile tea? It’s great for digestive health, relaxing, and is antispasmodic. It’s popular as a tea, but is also great for the skin. Sage – Every part of the Sage plant can be used for something. It’s name means “to cure”. There’s a whole long list of items sage is useful for so be certain to follow the link to read everything this wonder plant is good for. Now we could list so many more wonderful springtime herbs, but this short list is great to get you started. Remember that you can dry and save the usable plant parts as a tea, compress, and more. Be certain to read up on each one especially before using them in any great quantity. Be healthy and enjoy the wonders of natural herbals.